The cheats' cake is what I call it - Carrot Cake with Cream Cheese Frosting. It is the most easiest and foolproof cake ever; yet, the cake is very moist, dense and delicious. It is perfect as a celebration cake or a slice cake to share with your friends over coffee. Packed with carrots and walnuts, it is also a nutritious cake that your family will fall in love with. There are a few variations you can follow for the recipe. Please see notes. 1. Pre-heat fan-forced oven to 160°C. Grease and line cake pan with baking paper. 2. Sift flour, mixed spice and cinnamon into a bowl. Beat sugar, oil and eggs until creamy using a electric mixer. Add sifted flour mixture and continue beating until well incorporated. Fold in grated carrots and chopped walnuts. Spread into prepared pan and bake in oven for 1 hr or until a skewer inserted into the centre comes out clean. Stand in pan for 10 minutes before turning onto a wire rack to cool. 3. Beat cream cheese and lemon rind using an electric mixer, until smooth. Gradually beat in icing sugar until smooth. Spread frosting over cooled cake. Decorate with walnuts. This cake should be kept in a tightly closed container in a refrigerator. 1. Use 1/4 cup of oil + 3/4 cup of milk instead of 1 cup of oil for a healthier version of the cake. 2. Substitute walnuts with pecans for a different taste. walnut and cream cheese looks like you read my mind well :) lovely combination and looks so moist :) can i take that piece? These look so moist and delicious! 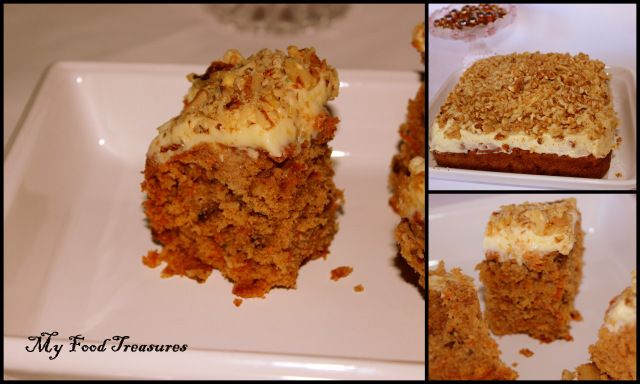 Love carrot cake..
Luvly cake...looks so delicious and inviting..wud luv to have a bite. Looks so soft and very tempting dear. Carrot cake + cream cheese topping is the perfect way to go. Lovely cake , craving for it now. That cake looks simply too tempting..
wow what a nice tempting cake. resolution is out of the window if i have this cake in front of me. too sad you are seven seas across. It's been ages since I made a carrot cake, so I'm really craving it now. Fantastic cake & tempting clicks! Wow, the frosting above is melting in the pic, just so tempting. I only wish somebody makes this for me, so that i can just gorge on! !